What course does the disease usually take? What kind of bacteria causes the cat-scratch disease? Exactly which lymph nodes will swell up with cat-scratch disease? Could one of the symptoms of cat-scratch disease be fever? If nursing a person who came down with cat-scratch disease: is the condition contagious? What is the therapy for the cat-scratch disease? What is the course of the disease if not treated with antibiotics? What has to happen to the cat which gave a patient cat-scratch disease? Does it have to be put to sleep? At first a reddish-brownish blister forms right at the scratch site. 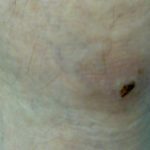 Many times this blister is mistaken for an insect bite and patients typically do not experience any pain associated with it. However, the blister site is the location where the pathogen develops and starts entering the body through the skin! In medical terms the location from which bacteria travels into the body is referred to as inoculation site. Most of the cat-scratch disease cases are caused by a pathogen called Bartonella henselae. After a few weeks the lymph nodes will begin to swell up. Those lymph nodes which are affected by Bartonella henselae may easily gain several centimeters in diameter as a consequence of the infection. The skin above the affected lymph nodes is reddish, warm to the touch and fairly sensitive to pressure. In some cases a lymph node may break through the skin and discharge pus. This depends on which part of the body incurred the scratch injury. If the scratch injury affected the hand or forearm, the lymph nodes of the elbow or the armpit will swell up. In some cases it has been reported that even the lymph nodes in the throat or neck had swollen up as the result of cat-scratch disease. The most predominant symptom of cat-scratch disease is the swollen lymph nodes. Some patients however in addition experience general symptoms such as high temperature, headache or fatigue. In very rare cases some atypical courses of the disease have been observed with ramifications on liver, spleen, bones and joints. Even the eyes have been reported to be affected in isolated cases. No! The bacterium Bartonella henselae is transmitted through the saliva of the cat. Even if there could be family clusters with several infected family members, the contamination most likely occurred through injuries involving the same cat, not because one person contracted the disease from another. The bacterium Bartonella henselae responds well to antibiotics like e.g. Doxycillin and Cibrofloxacin. These or a variety of other antibiotics do address the condition very well. Once a patient overcame the condition he/she will benefit from life-long immunity against it (as you can only contract this condition once in a lifetime). Individuals with good immune defense typically handle the disease fairly well even without the administration of antibiotics. Most of the symptoms will recede within one month time. Nevertheless the swelling of the affected lymph nodes may continue to persist for several months. No! It would be recommendable though to consult a vet in order to help the cat get rid of the germs. Since the pathogen Bartonella henselae is often transmitted from cat to cat by fleas, it is very important to keep the cat in a neat, flea-less environment (so away from other cats who may be infested with fleas like strays e.g. ).